We are a small non-profit, self funded rescue that is located in Western Sydney. 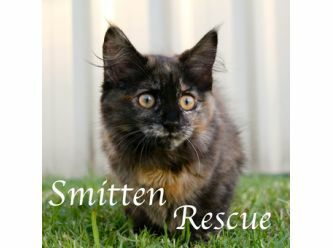 We rescue, rehabilitate and rehome cats and kittens that are in need. All of our adoption include desexing, microchipping, vaccinations, worming and defleaing. Meet the beautiful Finn and Phoebe. 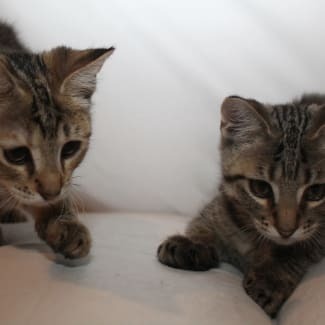 This brother and sister duo came into care after being abandoned at our local vet at just 3 weeks old. They were sick, scared and very thin. But since coming into foster care they have done nothing but thrive into beautiful kittens they are today. Finn is a lot more out going of the two but loves nothing but to be near you. He gets on well with all the kittens in care and loves nothing more than to play. Once he's all tired out he will happily curl up on a lap. Phoebe is a very sweet loving girl. She is very inquisitive and will follow you whether if it is handing out washing, loading the dishwasher or sweeping the floors and loves nothing better curling up on a bed of a night. Finn and Phoebe MUST be adopted together as they are extremely bonded. Both Finn and Phoebe comes litter trained, desexed, vaccinated, microchipped, wormed and flea treated. They both also is very good eater both wet and dry food.